Bats come alive in win at Dublin. Tripp Purser slides safely into third base. It�d been rough going offensively for the Royals thus far including a one-hit game at West Laurens Friday night. One figured that things would have to change eventually. They did Wednesday night at Dublin. Lane Kitchens would make it around the catcher to score. 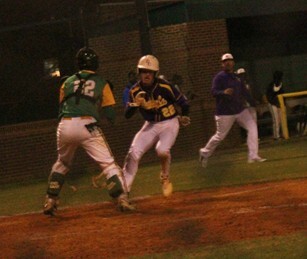 Three in the third put Bleckley up 4-0. Freshman Brody Little laced a two-run single in the sixth. Dublin loaded the bases with two outs in the sixth, but a Shayne Cannon strikeout ended the threat. It was the second time BC had worked out of a bases loaded jam. Cannon had an RBI double in the seventh as the Royals won 7-1. 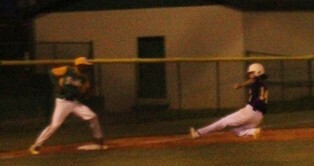 Carson Waters caught the game's final out. Cannon accounted for two of the team�s 10 hits, gong 2 for 4. He also struck out seven in six innings pitched, giving up three hits. 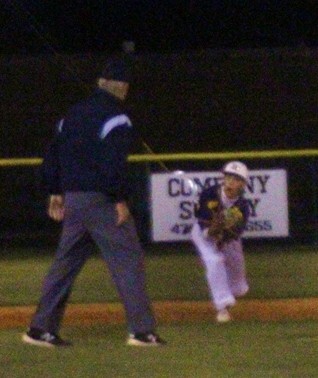 Little went 2 for 3 with 2 RBI. Sam Knighton was 2 for 3. Lane Kitchens went 2 for 4. BCHS hosts Washington County March 9 at 5:45 pm.